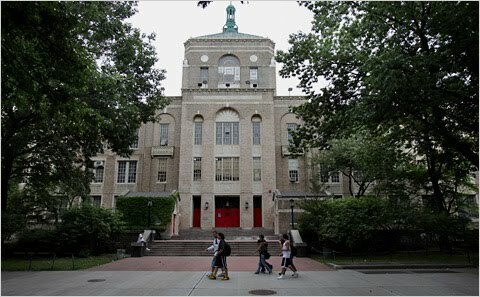 Violence at DeWitt Clinton High School escalated to such a point on Oct. 1, that police were called in and slapped at least seven juveniles with disorderly conduct notices, according to police and the Department of Education. Overcrowding, and what some students say is rampant gang violence at the school, has now culminated in chaos and administrators are scrambling to come up with a solution. The morning brawl, which numerous students interviewed said was related to gang activity, was followed a week later by Principal Geraldine Ambrosio’s declaration of a “building-wide emergency … continuing until further notice,” according to a letter to staff obtained by The Press. Police and the Department of Education said the violence was not gang-related. Both blamed the incident on the rain storm, which, they said, prevented administrators from getting to school on time, leaving some students unsupervised. “There was low teacher attendance due to the storm and the principal had students gather in the auditorium at the beginning of the day until classrooms were staffed. During a change of period, two students began to fight and several other students joined the fight,” DOE spokeswoman Marge Feinberg said in an e-mail. But students interviewed during dismissal on Oct. 8 told a very different story. Eleven current students, one former student and one parent said the violence was gang related. Two students were unsure and one said gangs were not involved. All of them wished to remain anonymous for fear of their safety. “It was multiple fights, people were getting jumped … somebody snuck in a machete and brought a gun,” a student, who planned to change schools out of fear, said of the incident. “Friday it was, like, a war zone … even the teachers were scared … we weren’t allowed to leave the classroom … ” One student estimated that 20 to 30 people in the school were in gangs. He said among the most popular were the Bloods and the Crips. Gangs aren’t the only aspect of Oct. 1 incident that students disagree with the DOE and police about. The DOE and the NYPD said no students were hurt during the incident. Students said otherwise. “I got jumped … I got hit with umbrellas,” a junior said. “I was just standing there … I hit one of them back and they ran.” The student said he was struck in the face and ribs. He went to the nurse, who gave him medicine for the pain and called his parents. He said he left school at 10 a.m. Detective Cheryl Crispin said the DOE, not the NYPD, handles minor injury cases where students are taken to the school nurse. Police presence at the school was increased after the incident. There were at least 13 uniformed officers outside the school during dismissal on Oct. 8, a week later. They told students not to stand in front of the school, ushering them off the sidewalks and across the street to the nearby park. A Facebook group called “I survived DeWitt Clinton 10/1/10” was founded after the incident and amassed nearly 500 followers in one week. “It’s like a jail in there,” a concerned parent said. Teachers have also been asked to act as security personnel. In the letter obtained by The Press the principal gave teachers “emergency patrol assignments,” asking educators to stand by exits during their professional development periods. Teachers were told to tell students to move to their next classes but were advised not to get involved in conflict. They were also asked to limit the number of bathroom passes they give out and enforce the “ten minute bathroom rule.” “Due to ongoing circumstances the UFT, in consultation with me [the principal], has declared a building-wide emergency. Please report to your assignment … until further notice,” the letter said. That’s not what professional development periods are normally used for, United Federation of Teachers Spokesperson Peter Kadushin said. “I don’t have one minute of any training but I am forced to be here by the door and I don’t know what to do,” a teacher, who wished to remain anonymous, said in a phone interview while guarding an exit. “I should be doing a lot of grading right now instead of standing here … it doesn’t make sense at all.” Officials at the school refused to comment. There are 4,388 students enrolled at the school — 956 more than there should be, according to the Enrollment, Capacity and Utilization Traditional Report. The building, which can hold up to 3,432 people, is operating at 128 percent capacity. A teacher, who wished to remain anonymous for fear of retaliation, said many offices and teacher’s lounges have been turned into classrooms. She described teaching a class of 35 students in a room that used to be an office. The source said there is nowhere in the makeshift classrooms to put textbooks. They are kept on radiators and, often, are thrown in the garbage by students who think teachers will be forced to pay for missing supplies. “Imagine a town comminuting every 40 minutes. Of course, even if people are well-intended, there will be accidents,” the source said. « WOW! UE* Union In Defense of Public Education! UFT/AFT: Which Side Are You On?